Welcome to the Stamper's Dozen Blog Hop! 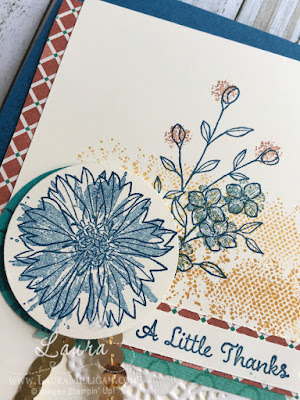 This month we are featuring projects that use two step stamps. I fell in love with the Touches of Texture stamp set while on the recent Stampin' Up! Mediterranean Cruise. We used this stamp set to make our gorgeous make and takes- I will share pictures of them tomorrow so please stop back to see them! I love the rich colors found in the Morocan nights designer paper, and pulled colors from the dsp for my inks and cardstock to create this card. This set I guess isn't technically a two step stamp set - but rather you use the stamps to "watercolor" the outlined images. I love the look! What do you think? Supplies used on my card are listed below - please click on any image to shop in my online store! And don't miss out! Get a $5 bonus coupon to use towards a purchase during August! Dapper Denim- 4 1/4" x 11", scored at 5 1/2"
Please feel free to email me if you have questions on how this card went together! I love to hear from you!